Brian France at a press conference in 2016. After his arrest for driving under the influence and possession of the opioid painkiller oxycodone, NASCAR CEO Brian France announced Monday that he’ll be taking an “indefinite leave of absence.” NASCAR announced that its executive vice president Jim France, Brian France’s uncle, will take the spot. 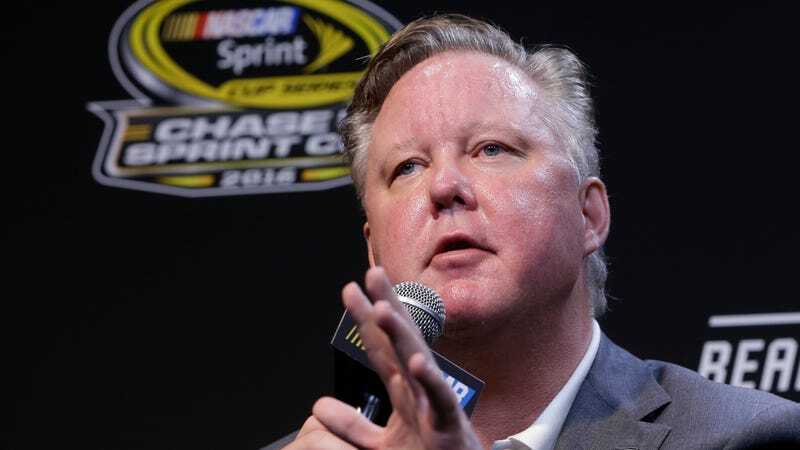 NASCAR sent the statements via email on Monday afternoon, with Brian France’s statement saying he would be taking the leave of absence “effective immediately” to focus on his “personal affairs.” NASCAR confirmed the leave, saying Jim France would serve as interim chairperson and CEO. “I apologize to our fans, our industry and my family for the impact of my actions last night,” Brian France said in the statement. Reports about Brian France’s arrest surfaced on TMZ Sports Monday morning, with the story saying TMZ “ha[d] learned” he was arrested after being stopped in Sag Harbor, New York for running a stop sign Sunday night. It went on to say the 56-year-old executive failed a field sobriety test, that he was in possession of oxycodone, and that he allegedly name-dropped important people he knew, including President Donald Trump, during the stop. “We take this as a serious matter and will issue a statement after we have all of the facts,” the statement said.